Mix 1 tbsp garlic paste, 1 tbsp turmeric powder ,1/2 tbsp chili powder and salt to fish pieces. coat it properly around all the sides of fish pieces. Keep it aside for 5 minutes. Now heat kadhai and pour oil to fry marinated fish. When oil is hot, add fish pieces and fry on low flame. Fry it properly from all sides. It will take approx 8-10 minutes. Meanwhile make thick paste of all dry spices using some water. Once fish is fried take it out and keep aside. Repeat this for all fish pieces. 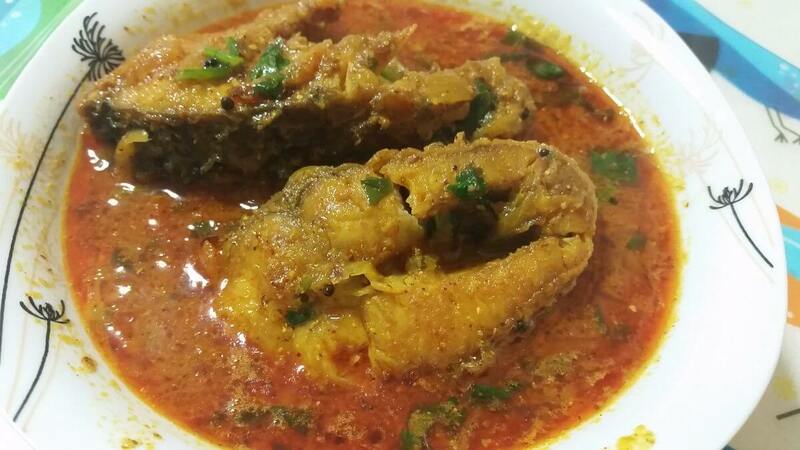 After frying all the fish pieces, will use same oil to make curry. So remove extra oil if there. Add mustard seeds to oil. When it starts spluttering, add onion and green chili. Cook it with stirring in between until onion turns golden. Once onion turns golden, add prepared paste (garlic,coriander,turmeric and chili) to it and fry it with continuous stirring until oil gets separated from it. Now add chopped tomato and salt. Cook until tomato is cooked completely. When tomato is cooked, add mustard paste to it and mix well. cook for 30 secs. Now add 2 cups of water and let it come to boil. Add Coriander leaves. 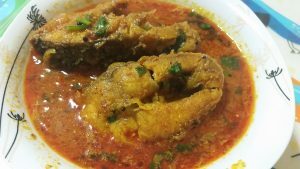 When gravy comes to boil, add fried Fish pieces to it and let it simmer for 5 minutes on medium flame. Now turn off the flame. Let it set for 5 minutes. Then serve hot with rice.